FACT: The flowers of the Arctic poppy fol- lows the sun’s movement across the sky. In this way it increases the temperature inside the flower creating an attractive microclimate for insects seeking warmth. 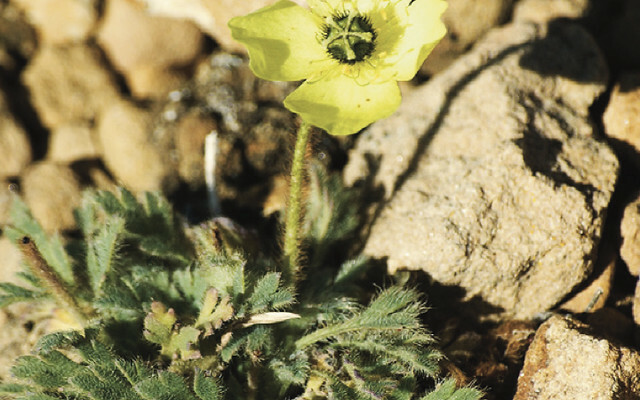 Papaver radicatum is a species of poppy known by the common names Arctic poppy, rooted poppy, and yellow poppy. It is circumpolar in distribution and grows in arctic and alpine zones in Europe, North America, and Asia. It grows at a latitude of 83°40’N on Kaffeklubben Island, making it one of the northernmost plants in the world. It appears on the Coat of arms of Nunavut.